Ohio guard Cece Hooks (#1) defends Katie Collier (#14) of Middle Tennessee State during the second half of the Bobcats’ game on Sunday, March 24 in The Convo. The Bobcats beat the Raiders 59-57 in the second round of the Women's National Invitational Tournament. The patios at the Pleasant Hill Winery on Friday, March 22. Ohio players celebrate as Central Michigan catcher Griffin Lockwood-Powell (#21, front) walks off the field after Tanner Piechnick’s walk-off grand slam, which gave the Bobcats a 12-11 win on Saturday, March 23. A competitor holds a pickle during the 2019 Pickle Fest at Bagel Street Deli on Friday, March 22. Stuart Brenkus reacts after shoving his last pickle in his mouth in the final seconds of heat two of the 2019 Pickle Fest on March 22 at Bagel Street Deli. Stuart Brenkus, left, and Madison Branch, right, struggle with the acidity of the pickles at the 2019 Pickle Fest on March 22, at Bagel Street Deli. E.J. 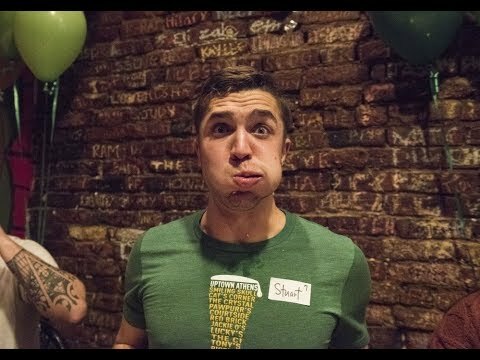 Goschinski, also known as ‘Pickle B----,’ eats his fourth pickle in the second heat of the 2019 Pickle Fest on March 22.